Collecting stamps from different countries on your passport is fun for children and adults. You can look through your passport and remember the places you have traveled. Many children have never traveled overseas and do not have a need for a passport. 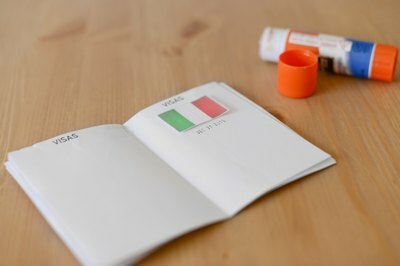 You can create a pretend passport to use with your children for local travels or as a learning tool. Use computer design software to design your passport. Your passport will use 5-by-7-inch paper folded in half to create a 5-by-3.5-inch passport book. Create three 5-by-7-inch page to design the cover of the passport and passport pages. Orient the page so the page is 5 inches high and 7 inches wide. Draw a line down the center of the page to create two 5-by-3.5-inch sections on the page. You will print this on standard size paper and cut down to size. Work on the first page to create the cover of the passport. The right half of the page will be the cover of the passport once folded. On the right half of the passport use text to write the word PASSPORT across the top. On the bottom part of the page type the name of the country the passport is from. Save room in the middle of the page to draw a country seal after the passport has been printed. Use an actual passport as a reference. Print the cover of the passport on cardstock. Print as many copies as needed. 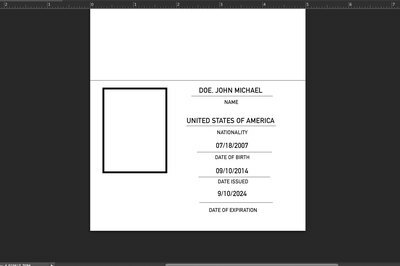 Design the rest of the pages for the middle of the passport using the pages created on the computer. The first page will have a picture of the child and the child’s information. Flip the page 90 degrees counterclockwise on your computer. You will have two rectangles on top of each other. The bottom of the rectangle should be 5 inches wide. On the top of the bottom rectangle type the name of the country. Add a 1.5-by-2-inch digital picture of the child to the bottom left corner. To the right of the picture type in rows of information in the following order: last name, first and middle name, nationality, date of birth, place of birth, date issued and date of expiration. Flip the page 90 degrees clockwise to orient the page in the original direction. 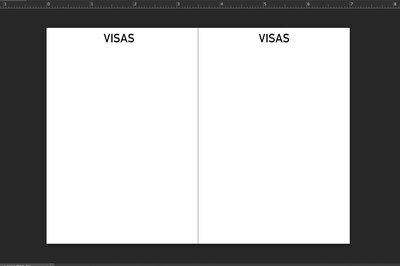 On the right half of the page type the word Visas on the top of the page. Design a page like this for each child you are making passports for. Add each child’s personal information and picture. Print this page on computer paper. 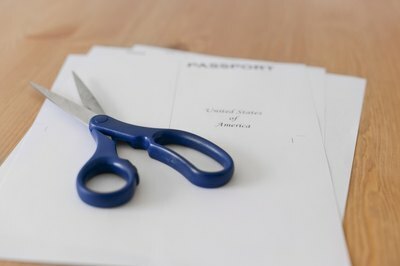 Use the last page created on the computer and type the word Visas on the top the page. Print six copies of the pages for each child with information on both sides of the paper. Cut all the pages printed to 5-by-7 inches as designed on the computer. Place all the pages on top of one another with the cover on the bottom. The page with the picture should be on top of the cover and the rest of the pages should be on top of the picture page. Fold the pages in half along the line created on the computer to divide the pages in half. Staple twice along this line to create the book. Draw a country seal on the cover of the passport. Let your child get involved and design his or her own seal. After your child visits a state or country, print out the state flag or country seal from the Internet and glue the flag or seal to the passport on one of the Visas pages. Stamp the date visited under the seal or flag. Allow children to pretend they are visiting places and add these places to their Visas section. You can use the passport as a home schooling tool. Add seals to the visa section after learning about different countries. If you are using the passport while traveling throughout the child's local country you can use the name of the city they are from for the cover of the passport rather than the country name.